Creating a realistic computer simulation of how light suffuses a room is crucial not just for animated movies like "Toy Story" or "Cars". Special computing methods should ensure this, but they require great effort. Computer scientists from Saarbrücken have now developed a novel approach that turned out to be so promising, that it was adopted by companies in record time—among others by Pixar, well-known in the movie industry for its computer animation, and now a subsidiary of the Walt Disney Company. The realistic depiction of light transport in a room is important within the production of computer-generated movies. If it does not work, the three-dimensional impression is rapidly lost. Hence, the movie industry's digital light experts use special computing methods, requiring enormous computational power and therefore raising production costs. Not only in the film industry, but also in the automobile industry, the companies invest to make lighting conditions for a computer generated image as realistic as possible. Already during the development process, entire computing centers are used to compute and display realistic pictures of the complex car models in real time. Only in this way, designers and engineers can evaluate the design and the product features in an early stage and optimize it during the planning phase. "They build hardly any real prototypes. Hence, the designers want to make sure that the car body on the screen looks exactly as the real vehicle will appear later," explains Philipp Slusallek, professor of computer graphics at Saarland University, Scientific Director at the German Center for Artificial Intelligence (DFKI) and Director of Research at the Intel Visual Computing Institute at Saarland University. With current computing methods, it has not been possible to compute all illumination effects in an efficient way. 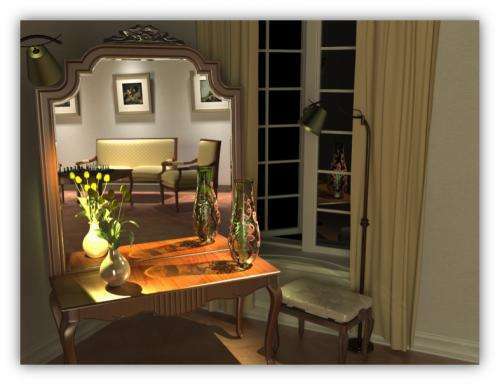 The so-called Monte Carlo Path Tracing could depict very well the direct light incidence on surfaces and the indirect illumination by reflecting light from surfaces in a room. But it does not work well for illumination around transparent objects, like semi-transparent shadows from glass objects, or illumination by specular surfaces (so-called caustics). This, on the other hand, was the advantage of the so-called photon mapping. But this method again led to disappointing results for direct lighting of surfaces. But since these two approaches were mathematically incompatible (Monte Carlo integration versus density estimation), it was not possible to merge them, and therefore it was necessary to compute them separately from each other for the particular images. This raised the computation costs for computer-animated movies like "The Hobbit: An Unexpected Journey", where up to 48 pictures per second have to be computed—for a movie whose "normal" version is 169 minutes long. The researchers from Saarbrücken also supplied mathematical proof that the results of the new computing method comply with those of the two former methods. "Our new method vastly simplifies and speeds up the whole calculating process," says Slusallek. The method "Vertex Connection and Merging'" abbreviated as VCM, was not only accepted at one of the most important conferences within the computer graphics research field ― SIGGRAPH ― in 2012, but was also very well received by industry. "We know of four different companies that partially integrated VCM in their commercial products only a few months after the scientific publication. The most recent example is the new version of the software Renderman developed by the company Pixar. For decades this has been the most important tool in the movie industry. We are very proud of this achievement," Slusallek says. The Californian (US) company Pixar, famous for movies like "Toy Story," "Up," "Finding Nemo," and "Monsters, Inc." is part of the Walt Disney Company. Pixar originally got its name from Apple founder Steve Jobs. Up to now, Pixar has received twelve Oscars for its movies. Slusallek and his research group are presenting a new scientific paper at the Siggraph conference, which is being held in Vancouver this year. They are demonstrating that the new VCM method can be implemented on highly parallel graphics processing units very efficiently. As this research has been funded by the American semiconductor producer Intel, among others, the researchers will be presenting their results at Intel's Siggraph booth.